A Book Lover Sets Up A Library For All – Grab a cuppa, tell a story or listen to one. She is a bibliophile (a book lover), a storyteller, a writer and a dreamer. 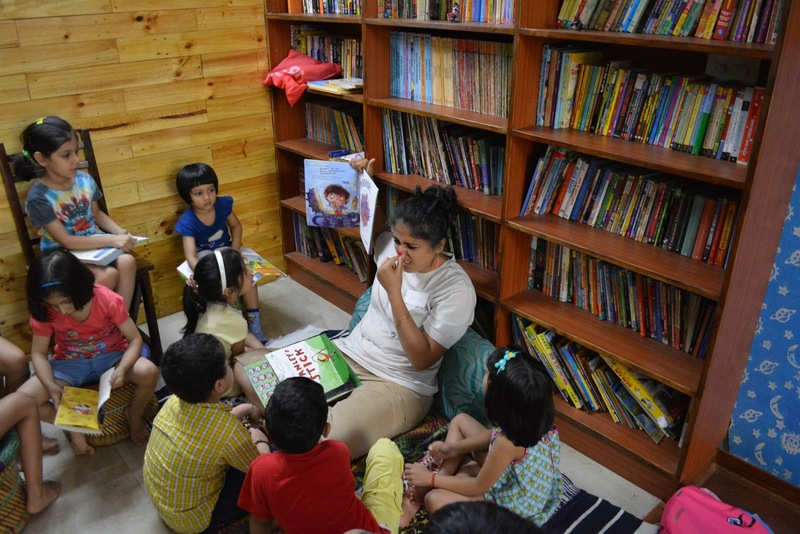 Her dream is simple – books and stories should be accessible to all. But she lives in a city that did not have a library. So our storyteller Tanu Shree Singh dreamt of building one for her city, Faridabad, India and this is her story. 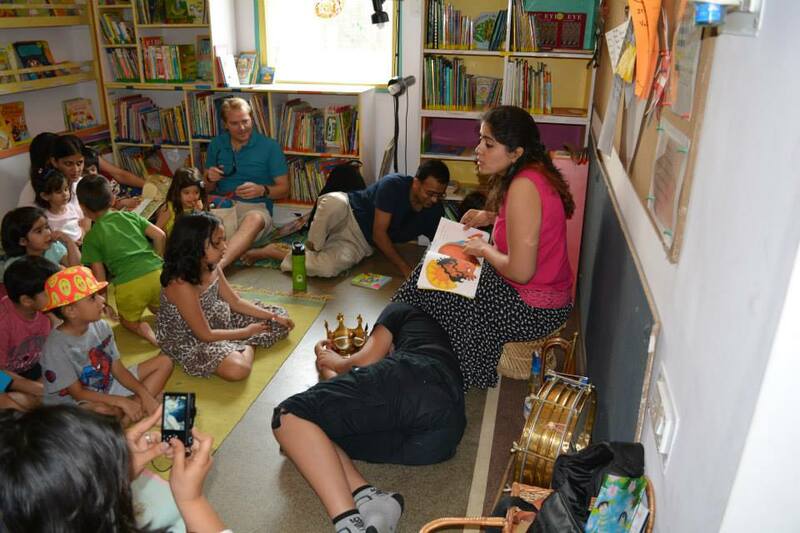 Tanushree at a storytelling session at Reading Caterpillar, Delhi. Stories preceded books. I remember being hauled up on my grandfather’s shoulders when he went for long walks. He would create these stories about animals on a train and keep me mesmerized for hours. Then my father would tell this yearly story about bears, a lion (who can fly a plane) and a trip to the moon. That was my first engagement with words. Then came the books that my grandfather would get for us and we seamlessly shifted from hearing stories to reading them. Early reading habits and now..
We had fairly limited choices back then – Lotpot comics, Chandamama magazines and the Classics from the local library. An occasional Tintin or Asterix by way of a birthday gift was treasured. A distinct influence was my nana /grandfather. He introduced us to the world of books, and my parents encouraged it further. Summer holidays meant trip to the local library to get a pile of books to scavenge through. Today I read everything. Picture books, middle reader series, young adults, grown up literature – I love it all. In fact the three of us are often found gushing over the latest Picture book additions to our library. So to pick a genre is not possible. ReadingRaccoons is a FB page where people talk and discuss books and ONLY books. With over 7000 members it is a very active group of parents of young book lovers. (And now there is a page for the senior raccoons too). The storytelling sessions are basically a medium to spread the love for books. The idea is to introduce children to a variety of literature. I try to explore authors beyond Enid Blyton and Roald Dahl and genres that otherwise are buried under taboos like appropriate age groups. So from Picture books to poetry – everything is read by a bunch of children with age groups ranging between 4 and 14. Her storytelling sessions are super fun. Usually involve a art work related to the story. The play is an interesting experience. This time for the Annual Storytelling Event, Pratham books chose “Ladle ka Dhol” which is a play. My group of children performed at Savera (a school for the economically disadvantaged) and Karm Marg (a children’s home) and it was a roaring success. It had always been there. One day I saw the children of my mother’s help react to books upon being read to. All I did was leave the books there. My Mum would occasionally read to them, and before we knew it, three of the kids started hurrying through their schoolwork to be able to read. That is when I knew that I had to do it. Library is the only way a book can be made accessible and my city had no good, accessible library for all. A library needs a space, shelves and books. 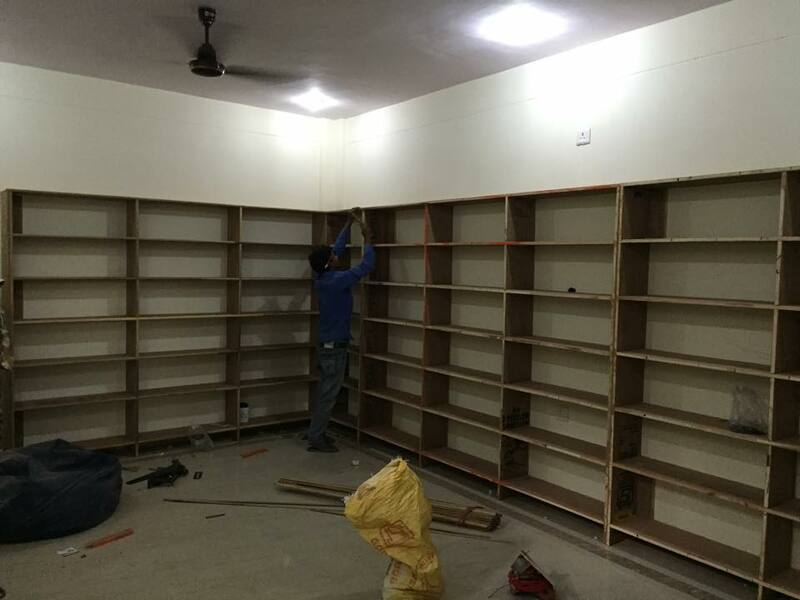 This is where Tanushree’s library is going to be. The work in progress library. The shelves are getting made. My father is a dreamer like me and so he takes my dreams fairly seriously. 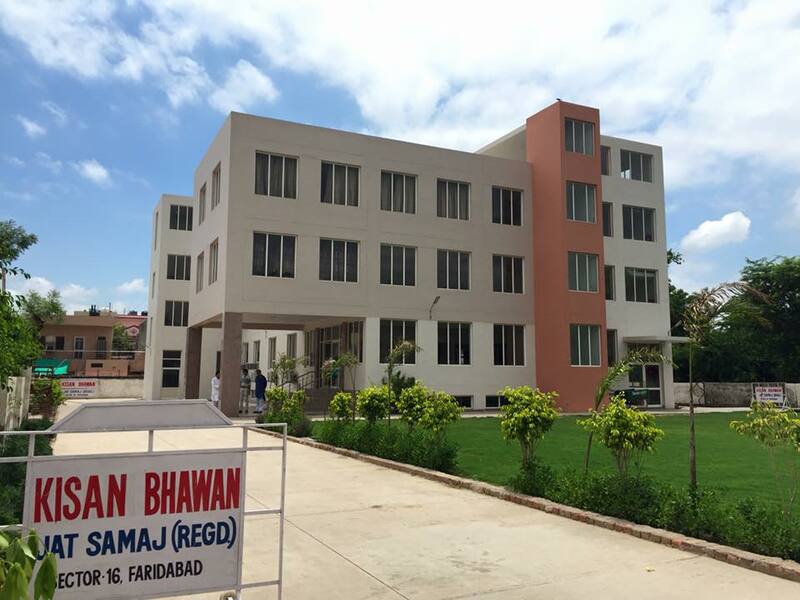 I mentioned it to him in passing and he bought the idea of setting it up in Kisan Bhavan. I was expecting a corner and they gave me a room! Shelves are being put in. The books are ready. Friends, and publishers have graciously donated enough to at least get it started. Initially I would come back from work and sit down to catalogue them all alone. Then I got lucky and two of my friends pitched in. So now they are all catalogued and ready to be shelved. We have a wish list up on amazon which we constantly update. The books can be ordered from here http://www.amazon.in/registry/wishlist/1MGGZPIRSP3MUOnce ordered, the order confirmation should be sent to ReadingRaccoons@outlook.com so that books can be removed from the wish list. 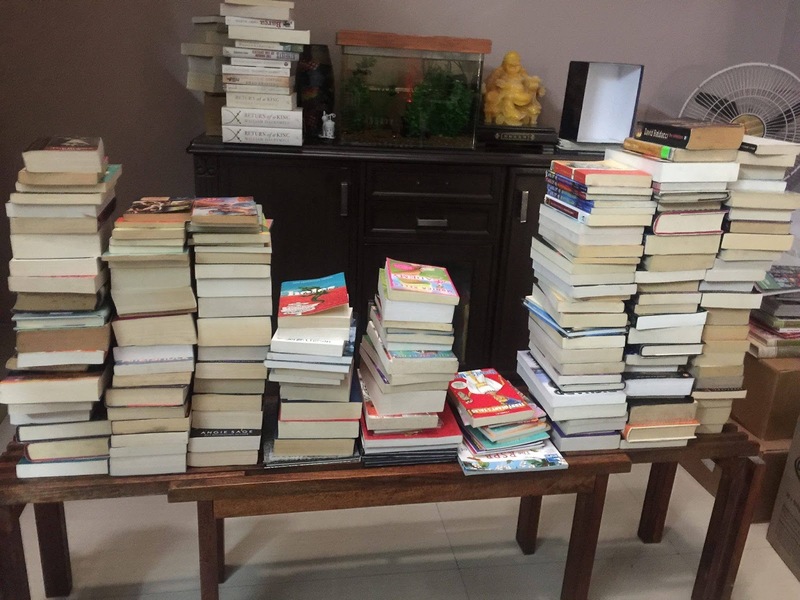 There is no minimum order, each book counts and matters. Each book that reaches us ensures that a bookworm is created. Dreams remain just that – a fine swirling mist unless they are firmly held on to and worked upon. And dreams are often ridiculed. So the idea is to be fairly block headed and going ahead and do it. I think fear of failure holds a lot of us back. I fear not having tried. So tomorrow, if at all it fails, I’ll be content with having given it my best effort. So anyone out there who has that strange dream which half the world laughs at, while the rest dismisses it, they need to grab it and make it real. Tanu Shree is a frequent storyteller at Chatoveracuppa. She is a parent to two boys, a lecturer in Psychology, a storyteller, a bibliophile, an artist and a baker among many of her other talents. She blogs at tanushreesingh.wordpress.com and at Huffington Post India. fantastic effort. keep it up. parts of the story made me really nostalgic reminds me of my days at karm marg. Oh Man! this is so inspiring Tanu! My Dad also takes my dreams pretty seriously, and is also helping me start a Reading Room in our society. We are still to find a space here (Bombay is awefully costly, you know) – so I must say you have inspired me to take it forward!